4 Bed , 3 bath exec villa restyled 2016. Our Wi Fi home has a romantic 4 poster bed in the Master suite with en suite shower bath & walk in wardrobe. The 2nd master ensuite has a King size bed with luxurious furnishings ,cable TV and enclosed wardrobe. Two Twin rooms have T&V's in each and are again styled with luxurious soft furnishings. Our home is ideal for a two generation holiday vacation destination with 2 living areas. One living room is fully tiled with direct access to the south east facing pool which is accessed via alarmed patio doors. You can sit here and keep a watchful eye on the children in the pool. The 2nd living area at the front of the house is quiet and calm and is ideal for the more mature family members or just those wanting 'space' when two generations are holidaying together. Our home is ideal for a 2 generation family and sleeps ideally 8 people. The house has a security alarm that is linked directly to the Sheriff's Dept. The resort is manned 24*7 by qualified security officers. The superb clubhouse offers daily activities for children whatever the weather. This includes themed pool parties which include the latest films being shown on large screens whilst you "bob" around in the pool.Marshmallow roasting , free dougnuts ,coffee and tea are regular daily activities. The clubhouse has a large outdoor pool , cabanas , hot tub / spa, Gym ,WiFi , snooker table, Disney outlet ,TiKi bar (serving Alcohol & simple snacks - Wings, hotodgs etc ) BBQ's , 18 hole mini golf , volleyball , childrens soft play area etc. Golf : There are many excellent courses within close proximity with Highlands Reserve being 3 minutes away and the Omni Resort just over 2 miles drive. There are many other courses within 5 mins drive - you can play for as little as $15.00 a round at some of them. This is our home - we bought it here because its really close to Disney, Very Safe being in a walled community and has fantastic facilities. All bathrooms have hair dryers, showers and baths. The TV also has chromecast so you can watch your own movies or Video games . The Kitchen is open plan into the breakfast nook and the Den so you can cook and still see the family. Also has chromecast if you have a Netflix account or want to play games or watch Youtube. Just download the App. There are a number of board games for you to use. The club house has a mini golf section and Highlands reserve Golf club is just over the road from the Sub division. The pool is in the Sun all day (10am until sun down) so that you can get that sun tan when you want it. Many Villas don't have the sun all day, its either over the pool early morning until mid day or late afternoon to sun down. This can be frustrating if you want to come back from the parks to relax but the pool is in the shade. At our Villa you wont have that problem. The Superb clubhouse offers many more facilities such as Daily English papers, Tikki Bar for Beer , Wine and soft drinks around the high quality pool. Also events for the children such as face painting and film nights around the pool (float in the pool and watch your favourite movies). Great house with everything you need! We enjoyed our stay at the villa and would stay again. The house was spacious and provided us exactly what we needed for our stay. I would agree that the pictures don't do the house justice. It is very well maintained and clean. Loved the pool area, my kids spent countless hours in it! Thanks for the great vacation stay! Thank you for your lovely comments , we hope you book with us again. My family and I stayed at this home utilizing it as our base while exploring the Disneyworld parks. Travel time to most parks is 20-25 minute during non peak time which we felt was reasonable. Save some $ not staying at a Disney hotel, and come back from a busy day of crowded parks to peace and quiet in this gated community . Even with the rental car, and parking each day there was a huge savings. The home is spacious, and having the pool literally steps from the living room made our daughters stay even better. We didn't really utilize the community pool or gym (slightly disappointing for our teenage son) as it closed by 6pm it seemed, but we didn't rent the property for this purpose. Dollar Store and Publix are close, both good places to stop after taking inventory of whats available at the home for cooking etc.. Thank you for taking the time to comment on your stay. I am please you enjoyed your period there. The Clubhouse is there primarily for the Home Owners on the sub division who don't utilise the facilities in the Autumn / Winter hence the early closure. The hours of operation are later during the Summer. We look forward to perhaps welcoming you and your family once again. House was great and exactly as described. Location is ideal and easy to get to everywhere. Pool has sun all day which was fantastic. Owners great to deal with and would definitely stay again. Very clean and cared for house. Will not be returning though. Your home was exactly as described and pictured. I had brought some essentials (like paper towels, toilet paper, dish soap, etc) just so that we wouldn't have to go back out once we arrived and found that I needed have bothered because everything we needed for our stay was already thoughtfully provided. There were even small toiletries in every bathroom. The beds ( especially the one in the master bedroom) were extremely comfortable. We walked over to the clubhouse a few times and played ping - pong and pool and our youngest played at the park. The staff on property were very helpful. When we were looking for a pizza place, my husband went over to the guard house and the guard provided him with suggestions and menus from local spots. Lots of shopping was nearby in any direction and we were only minutes from Disney and not too far from Clearwater beach, where we also visited during our stay. Ian and Karen were very responsive to my numerous emails before and even after our stay, as we had never rented a home through VRBO before and I had lots of questions. They made this a very enjoyable stay and I would definitely recommend this home to anyone looking for one in that area and if we ever get back there again, we would love to book it again for our stay! Only minutes from Disney, Shopping Malls and Great Golfing resorts this holiday home is a must for a relaxing holiday in the Orlando area. Orlando is at your finger tips, just 2 mins from the villa are great shopping malls with bars and restaurants on the 192. Highlands Reserve golf course is 2 minutes away , with the Omni approx. 3 miles SW. 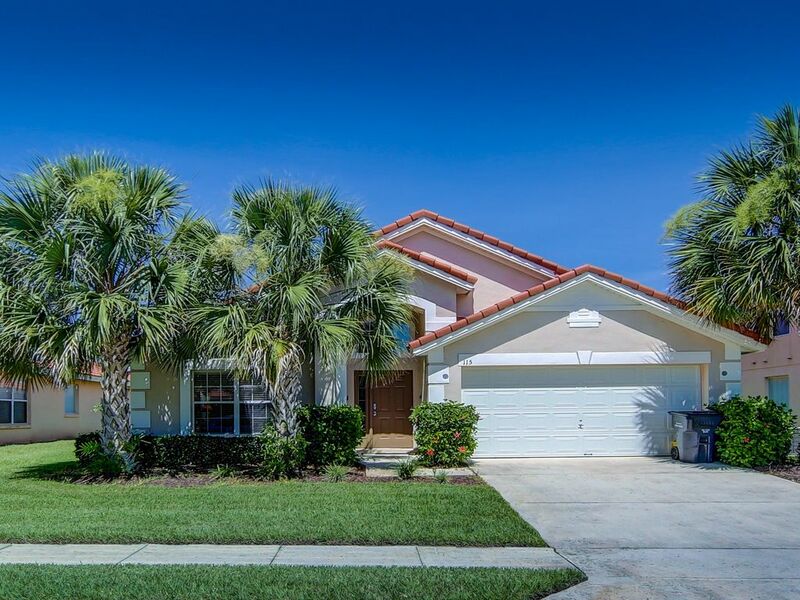 Situated in the most desirable location on the I27 close to the I4 and 192 you will have easy access to all the main attractions of Disney, Sea World, Universal, Bush Gardens, Sarasota and many more great attractions. If you don't want to go anywhere, just chill and relax around the pool or walk to the club house and relax around the huge pool or jump in the hot tub to relieve those aches and pains from a hard day in the parks. For those of you with teenagers - let them catch up with the news in the cyber cafe or do some exercise in the state of the art gym. Whatever you need from a holiday, this home is the place for rest and relaxation.